Non-melanoma skin cancer occurs much more frequently than malignant melanoma skin cancer. The umbrella term ‘non-melanoma skin cancer’ refers to a variety of skin tumors with different characteristics. Up until now, over 50 subtypes of this skin cancer are known. These types of skin cancer occur considerably more often than malignant melanoma skin cancer. This means that the prognosis is significantly better and only rarely fatal in this form. 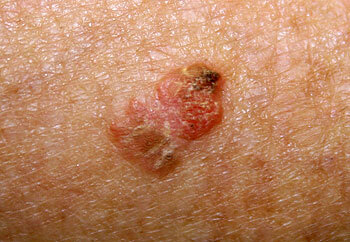 If this type of skin cancer is detected early enough, it is curable 100% of the time, as a rule. Non-melanoma skin cancer can take on the most varied forms of appearance, so that those affected may not recognize the change as cancerous. For this reason, skin changes of all types should definitely be examined by an experienced dermatologist. The most common forms of these skin cancers are the basal cell carcinoma (basalioma), the squamous cell carcinoma (spinocellular carcinoma, spinalioma, ‘prickle-cell’ carcinoma) and a variety of early skin cancer stages such as actinic keratosis. The basal cell carcinoma is a form of non-melanoma skin cancer and one of the most commonly occurring skin tumors. The basalioma begins in the basal cells of the upper skin layer (epidermis) and develops primarily in areas that have been exposed to the sun. In 80% of all cases it develops in the head and neck area, but the torso and the extremities can also be affected. 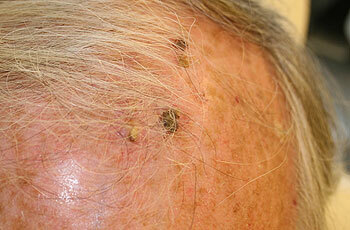 A basal cell carcinoma grows on the place where it first appears. This means that a basalioma normally does not spread out and therefore does not develop secondary tumors (metastases). If untreated, the skin tumor can grow perpetually, so that it can penetrate deeper into the skin and destroy the tissue structure there. In extreme cases it can even affect the bones. Usually, the basalioma occurs in women and men in the later years of life in equal measure, however, younger people are also being affected increasingly. Fair-skinned people with a high level of sensitivity to light and a lack of ability to tan are the most at risk. The thickening of the skin which occurs as a result of intensive and long-term UV exposure is referred to as actinic keratosis also called ‘solar keratosis’ or ‘sunspots’. This chronic damage to the upper skin layer (epidermis) is considered an early stage of squamous cell carcinoma. Actinic keratosis primarily appears on parts of the body which come into the most contact with sunlight. The face, décolleté, back of the hands, the forearms and hairless scalps (bald heads) are the most frequently affected by solar keratosis. However, actinic keratosis can also occur on other parts of the body after intense exposure to sunlight. If actinic keratosis goes untreated, it increases slowly but steadily in size and results in increased production of calluses or thickened skin. Since actinic keratosis normally grows very slowly, skin cancer may only develop after several years or decades. Problems such as itching or bleeding seldom occur during this time. Even though actinic keratosis on its own is harmless, you should still - as soon as it is detected - get it treated so that it can’t develop into skin cancer at all. When it is detected and treated early, surgical intervention is not necessary in most cases. Actinic keratosis occurs predominantly in the second half of life. Men are much more frequently affected by ‘sunspots’ than women. Fair-skinned people with a high level of sensitivity to light and who don’t tan easily are the most at risk. The remarkable increase in chronic photodamage in the last few years is primarily due to changes in leisure-time behavior (outdoor activities/sports) and ‘tanned skin’ (sunbeds, tanning salons) as a beauty ideal. Squamous cell carcinoma, also called spinocellular carcinoma, spinalioma or ‘prickle cell cancer’ is a more aggressive form of skin cancer than basal cell carcinoma, which often develops from the early stages of skin cancer such as actinic keratosis (‘sunspots’). It is the second most frequently occurring skin tumor. The spinalioma starts in the middle layer of the skin’s epidermis (prickle cell layer) and primarily occurs in places that are exposed to the sun. In about 90% of all cases, it occurs in the head or neck area and can even affect the mucous membrane of the mouth. However, other parts of the body can also be affected. If spinocellular carcinoma is not detected in time and/or remains untreated, it can spread in particular into the lymph nodes in some cases where it can build up secondary tumors (metastasize). Men are affected much more frequently by squamous cell carcinomas than women. The spinalioma usually occurs in the later years of adult life, however, this form of skin cancer is increasing in the amount of younger patients too. Fair-skinned people with a high level of sensitivity to light and who don’t tan easily are the most at risk.